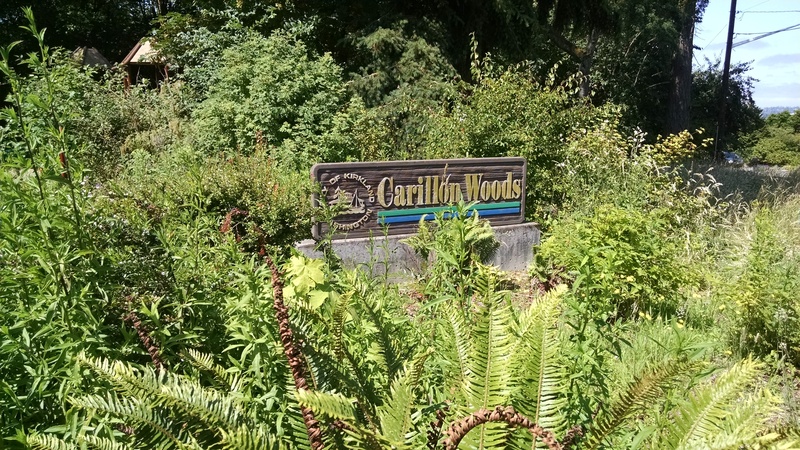 Carillon Woods, at 5429 106th Ave NE is a lovely wooded park with nice play equipment and plenty of trails through the woods. 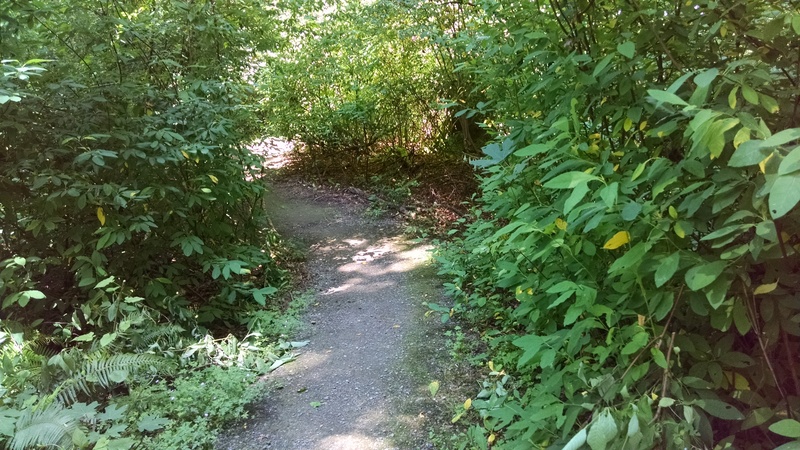 It’s tucked away in a neighborhood about a quarter mile east of Carillon Point, and just west of Northwest College. The sign shown above is in the midst of the butterfly garden which had lots of bees gathering pollen and some butterflies on the day we were there. It also has an interpretive sign about the butterfly life cycle. 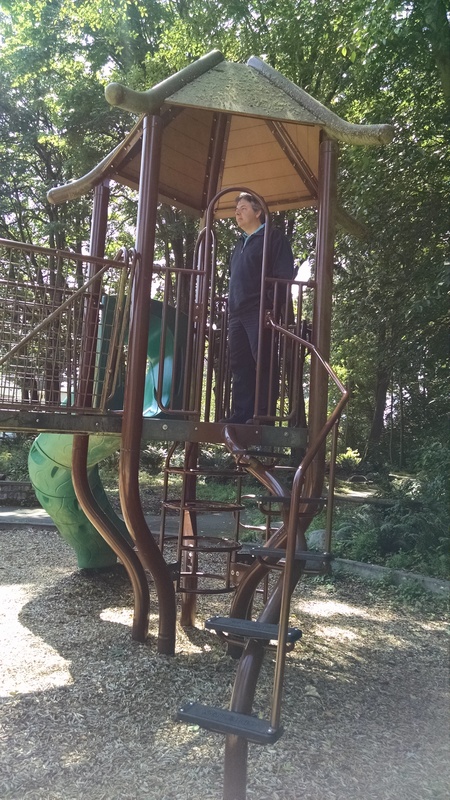 The play structure is a nice one for ages 3 – 9. It’s got lots of ways to climb up: regular stairs, two ladders up the centers of each tower, a climbing rock, tricky stairs (the fourth picture below), and loop ladders up the sides. 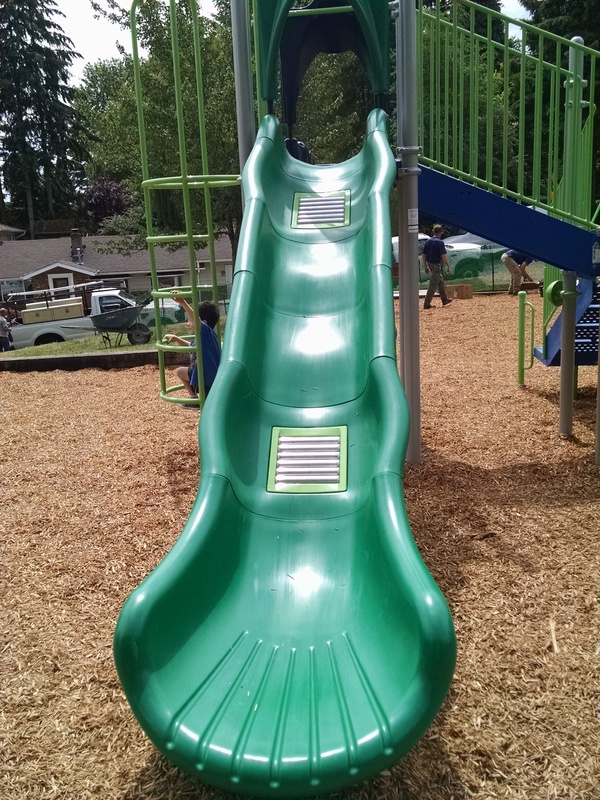 For ways down, it has a pair of toddler size slides, and a mid-size slide. There’s a long “bridge” connecting the two towers. 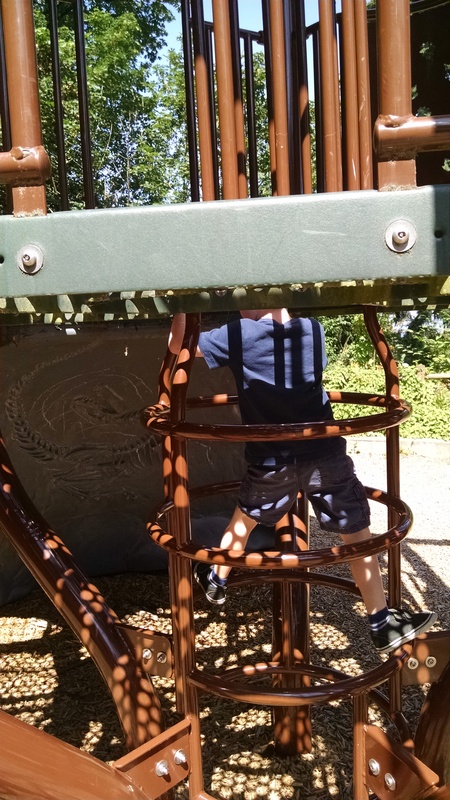 The playground was partially in the sun partially in the shade at 11 am. 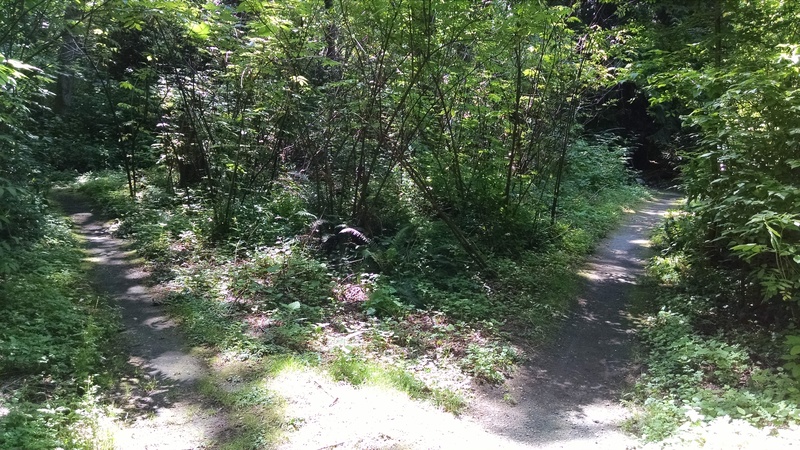 It was a fairly hot day, but all the dense greenery of the park helped the shady areas feel quite cool. 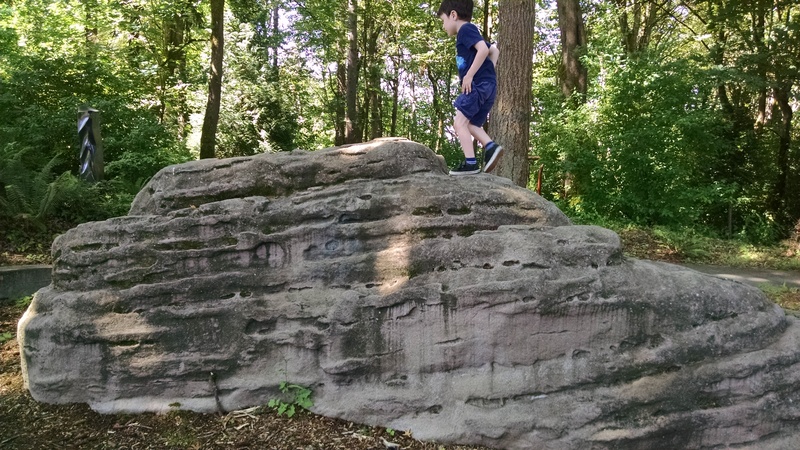 Around the corner, you’ll find a nice climbing rock with some comfy benches to sit on and watch your child climb. It’s an artificial rock, and you can definitely tell by the hollow sounds it makes when you climb on it, but with several years of moss and dirt on it, it looks surprisingly realistic. 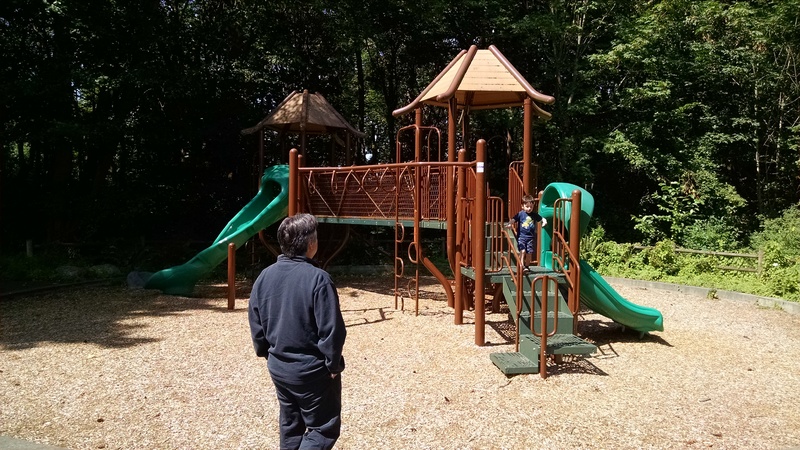 The wood chips around it are deep and soft – as my husband walked on it, you could see the chips sink down an inch or so, and slowly raise back up as he moved on. Around the corner from there are swings. 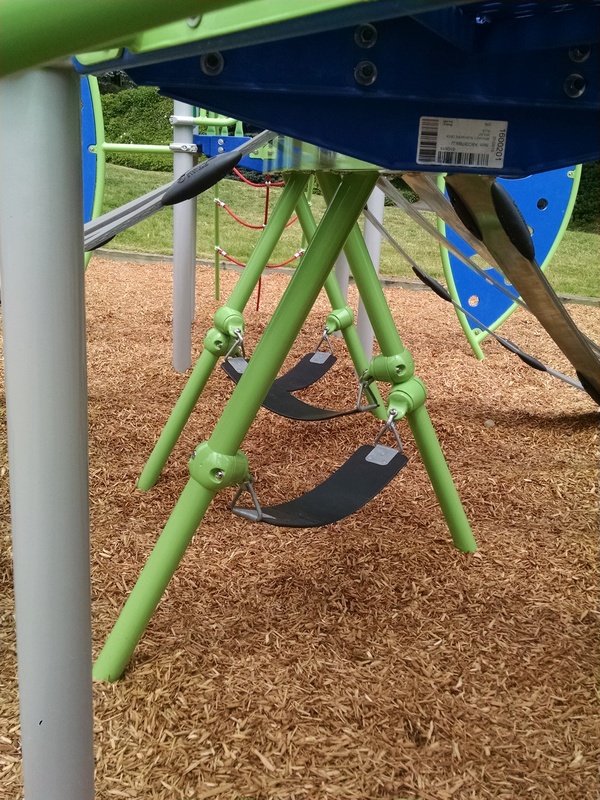 They’re both kid style swings – no toddler bucket. 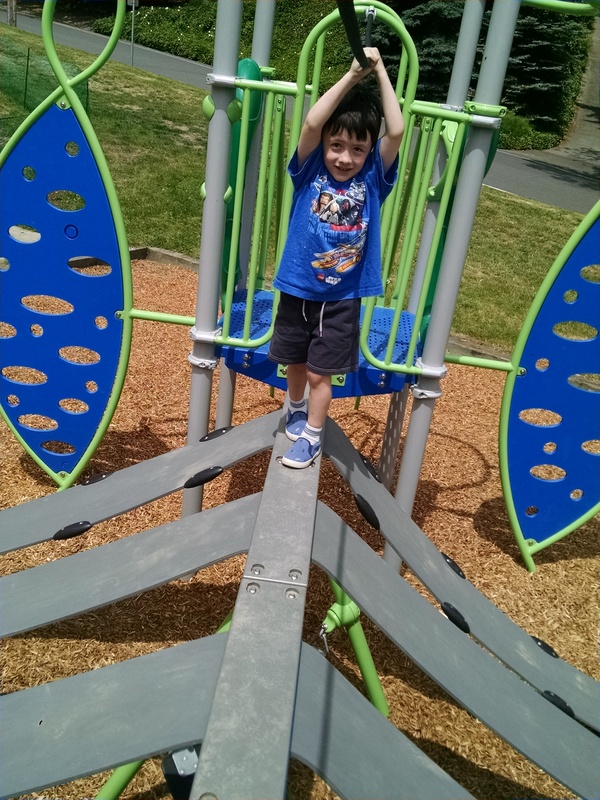 The climbing rock and swings are very shady, so good for a hot day. 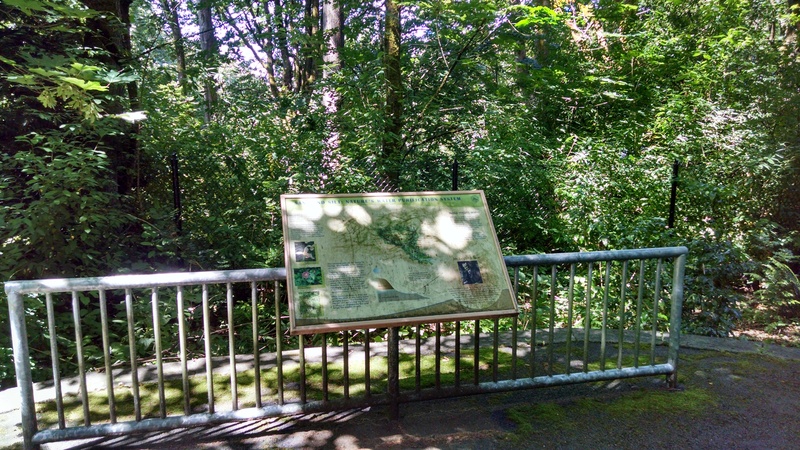 Then there are the trails – there’s a short paved loop (plenty long enough for a tricycle outing) that takes you around the play equipment and back to this interpretive sign about water, and a bench. There are no bathrooms at the park. We were there from about 10:30 – 12:30 on a sunny Tuesday, and saw one man walking his dogs, one grandma with a toddler, and one other family arrived just as we were leaving. I don’t know if that’s typical usage or not. If you’re looking for a busy park packed with kids, this may not be it. But, if you’re looking for a quiet and really lovely park, where you’re surrounded by lush green foliage, this is a great park for you! Note: this park is not as well maintained as we’re used to in Kirkland. The playground could really use a pressure washing (especially where the moss is growing on the roof) and there’s lots of weeding to be done. But there’s no trash or anything – so the users keep it tidy. 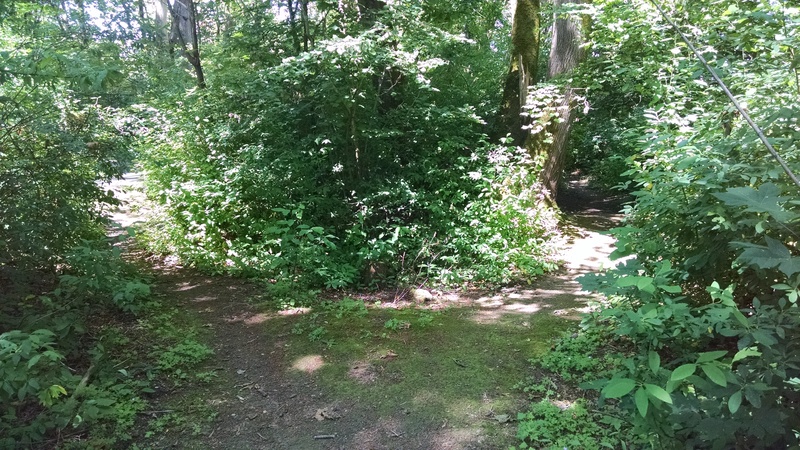 This entry was posted in Eastside Parks, Nature Activities, Seattle area and tagged bellevue, Kirkland, parks on July 7, 2016 by Janelle Durham. 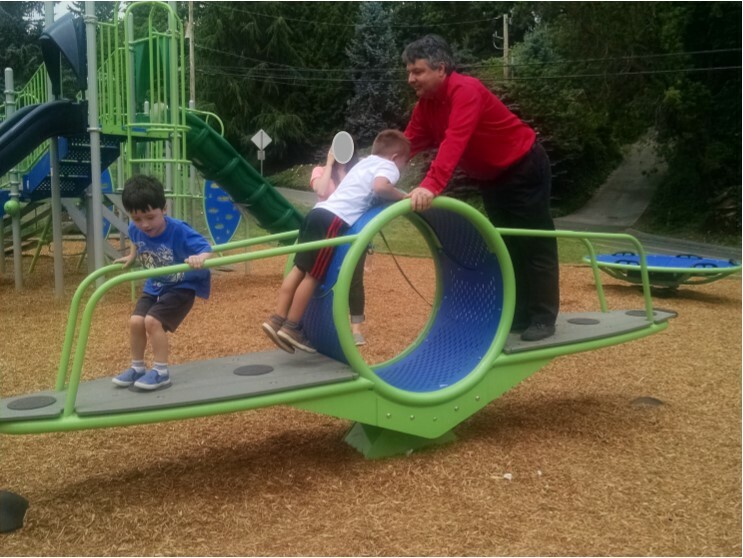 Van Aalst Park in the Norkirk area of Kirkland has just opened a brand new playground. We went there today to check it out. It has some fun, unique items I have not seen before in another playground. 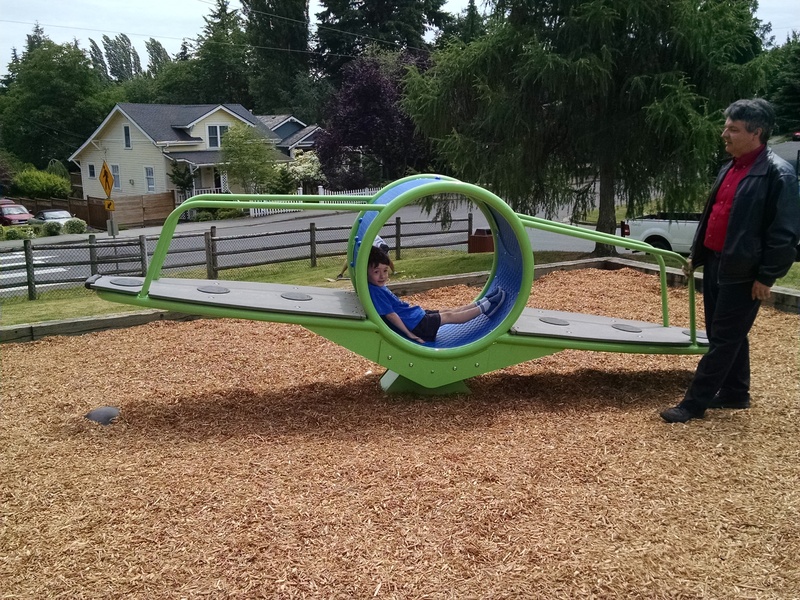 From the pictures, you can tell one of the cool things about it: it has a ring in the center where a child can sit and be rocked back and forth. 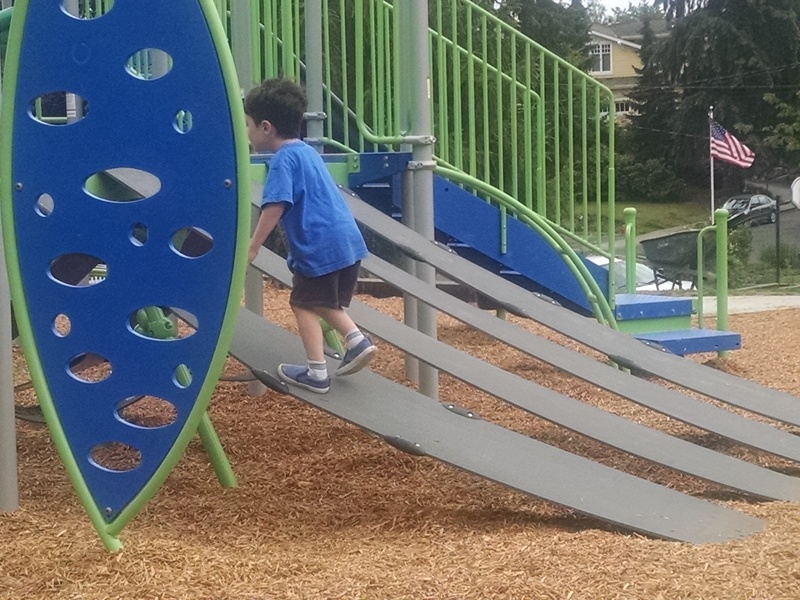 But even cooler – this is one of the best kinesthetic seesaw experiences I’ve seen / had. 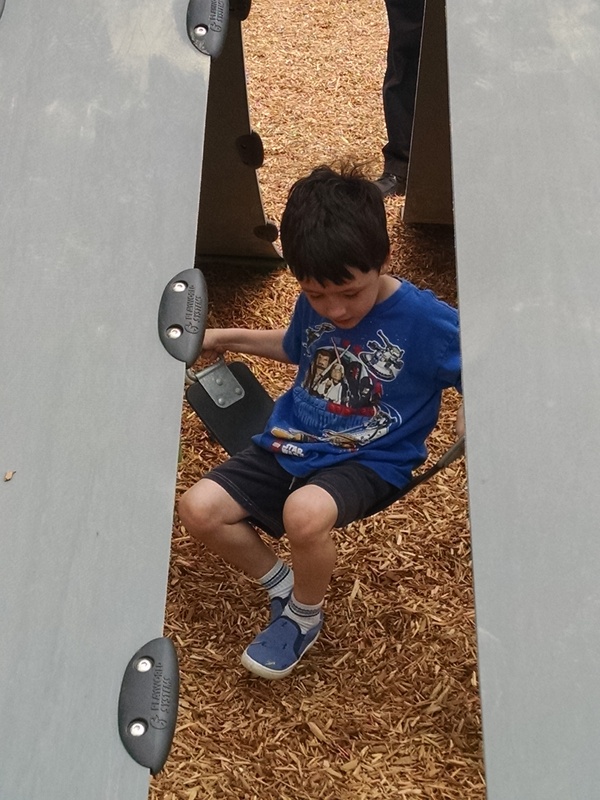 On a typical seesaw, it’s just a plank, and you sit behind a handle on one end. If you have two kids on there who are completely different weights, you have to balance it by putting one on the end behind the handle, and one sits somewhere on the other side between the handle and the center, like in this picture. (photo credit: P6141315 via photopin (license)) But they pretty much have to sit still in that place. And only a few people can ride at once. 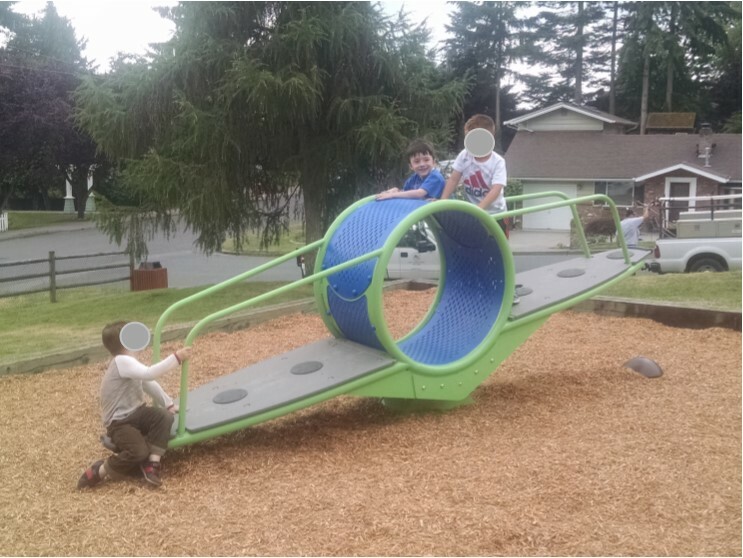 On this one, it’s big enough that 3 – 4 kids can fit on each side (plus the kid in the middle makes up to 9 kids of varying ages and weights!) 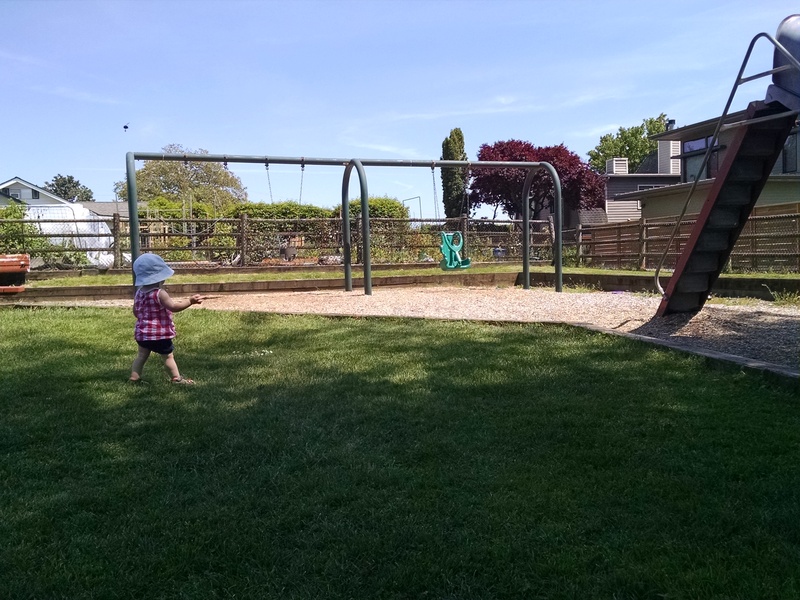 If there’s only a few kids, they have a lot of room to move back and forth on their side to find the sweet spot for balance. 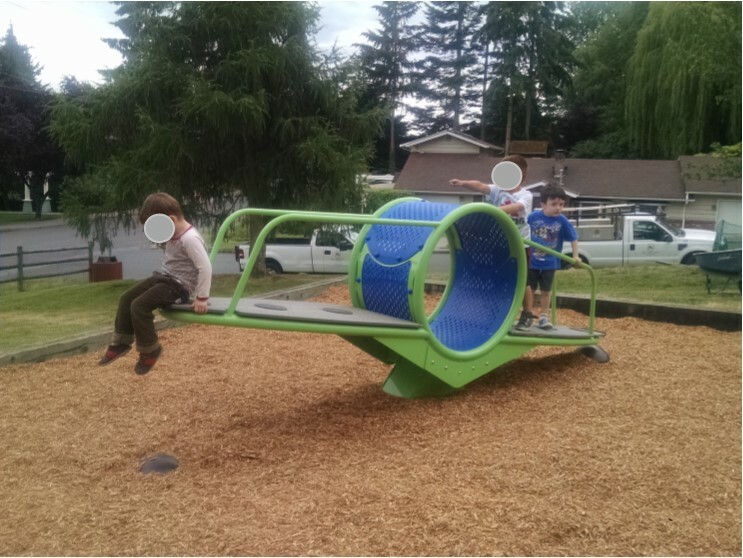 In the first two photos, you can see a team of three boys who had it figured out… the solo kid would scoot all the way back while the other two ran in and leaned in till it tipped. Then the pair would walk toward the end until it teetered their way. There was lots of giggling and shrieking involved! 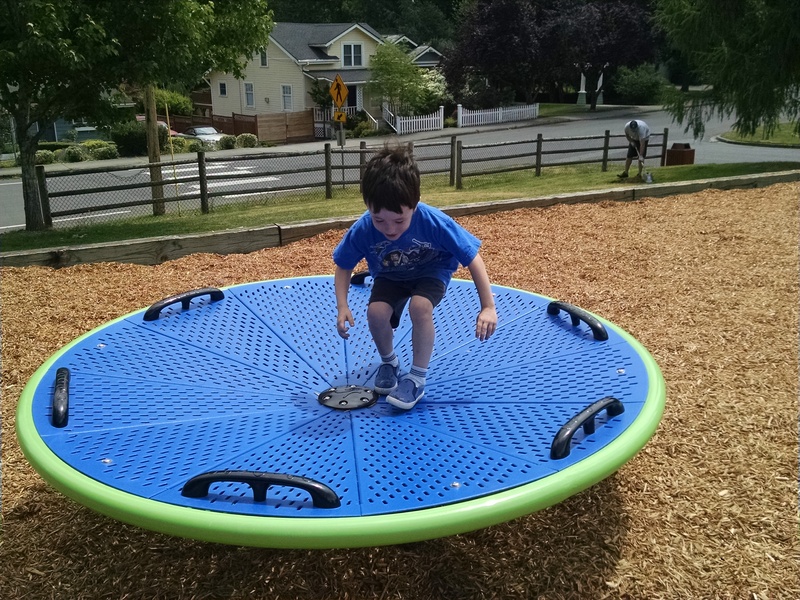 I could teeter totter with my son, who weighs 40% what I weigh, and I could also teeter totter with my husband who weighs 170% what I weigh. This sometimes involved one person perched out on the VERY end of one side leaning outward, while the other person stood in the center, leaning inward over the center piece. But you could do it! Merry-go-Bounce. 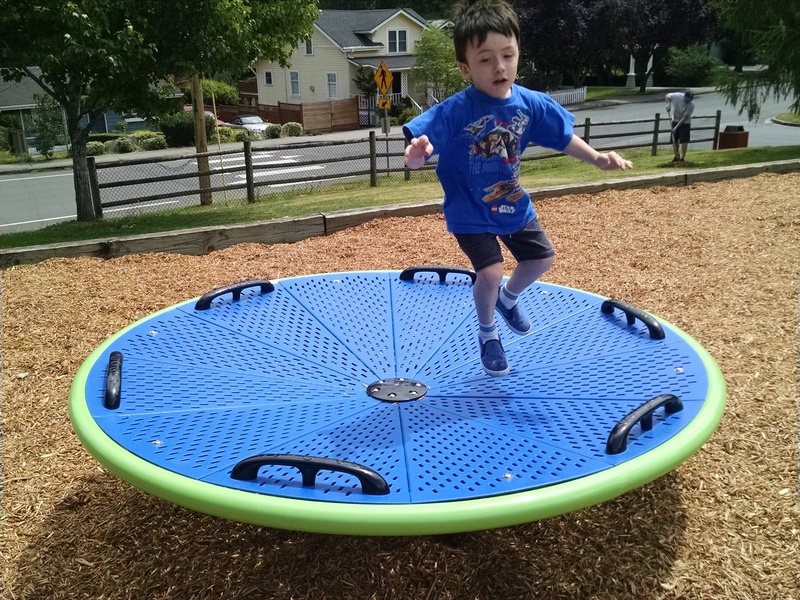 From the picture, you might think this is a merry-go-round, which spins. 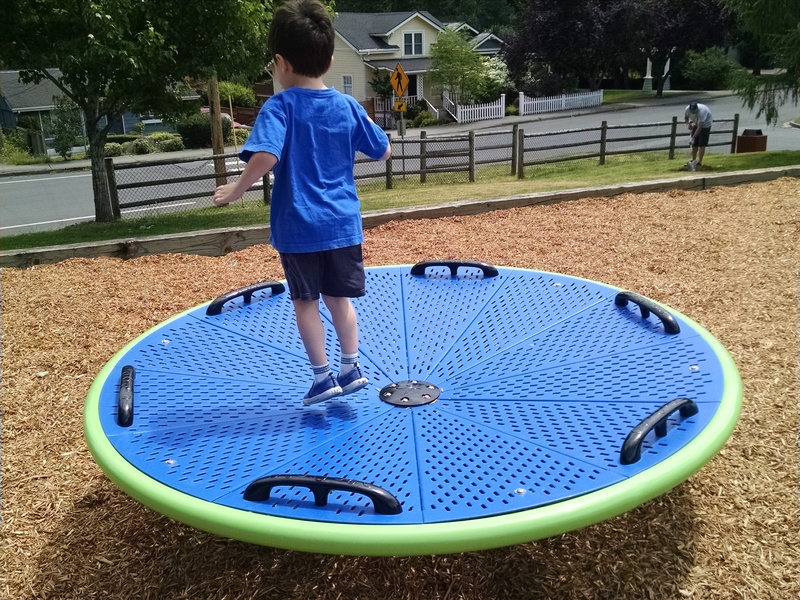 But, it doesn’t turn at all – it’s mounted on springs and it bounces up and down when you walk and jump on it. 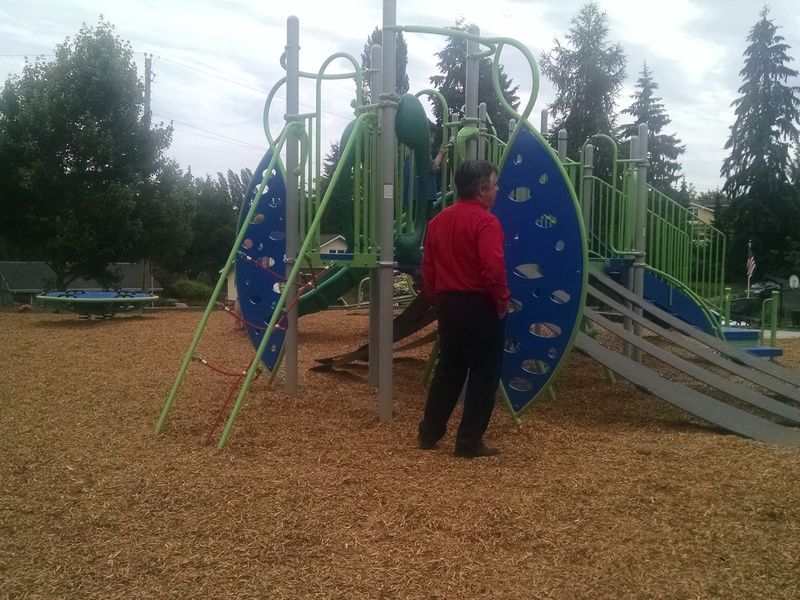 We saw kids playing alone on it, moms and kids, and group of five middle school girls. Washboard Slide. This slide has two sections in it that have little spinning rods (kind of like the conveyor belt in airport security lines where your carry-on and bins get rolled along.) It’s a fun novelty. 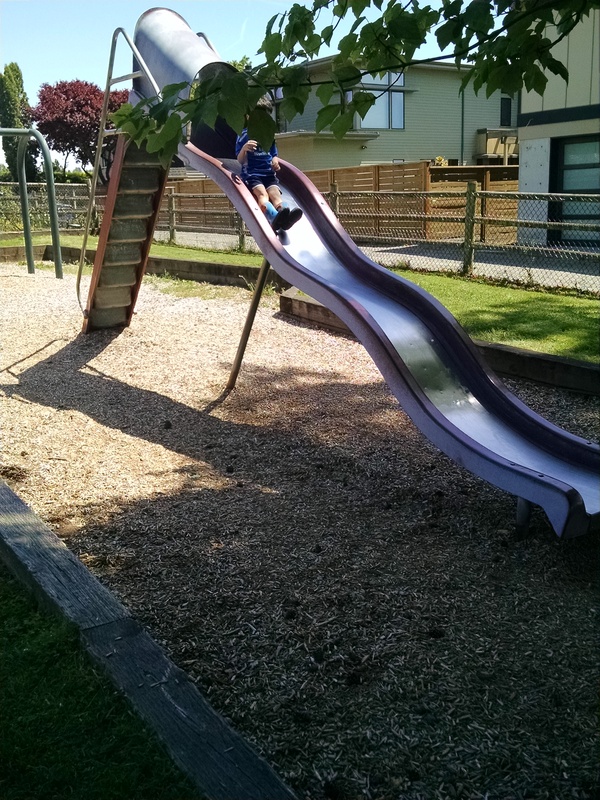 My son said it felt a little different (more “rumbly-bumpy” than a typical slide.) I tried it out and agreed – it wasn’t crazy different, but it was interesting. 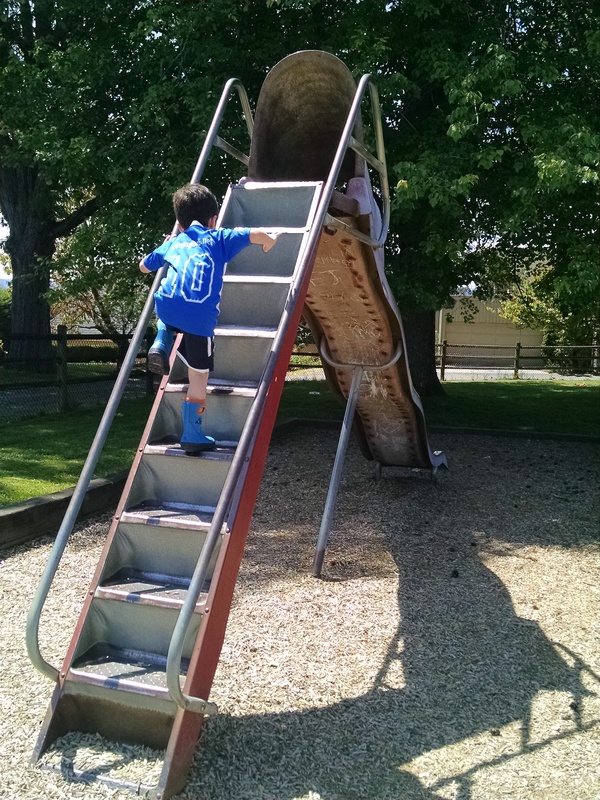 When climbing up the slide, don’t put your feet on the washboard! Balance Beam: The ramps lead up to a narrow beam, for balancing on, with a rope above to hold onto to steady yourself. Mini Swings: Under the balance beam were these little mini-swings / seats – they don’t swing much, but my son liked them. Swings: They were installing the new swings while we were there. It took a REALLY long time. But it looks like there will be one kid swing and one toddler/bucket swing. 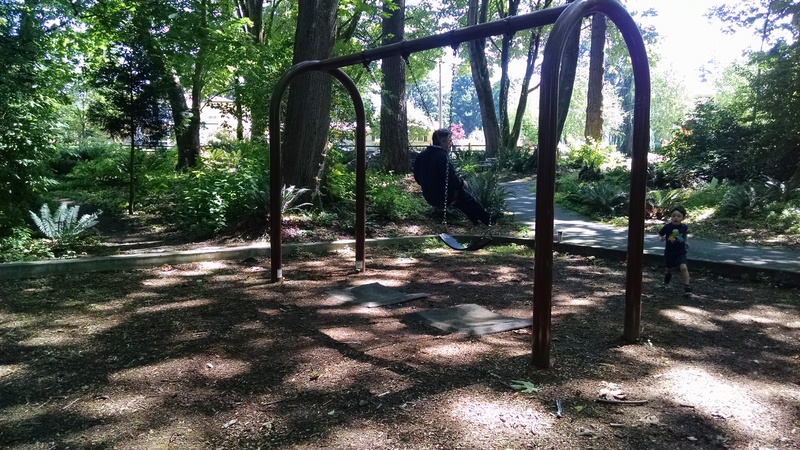 When we left, the kid swing was hung really high – the perfect height for an adult male! 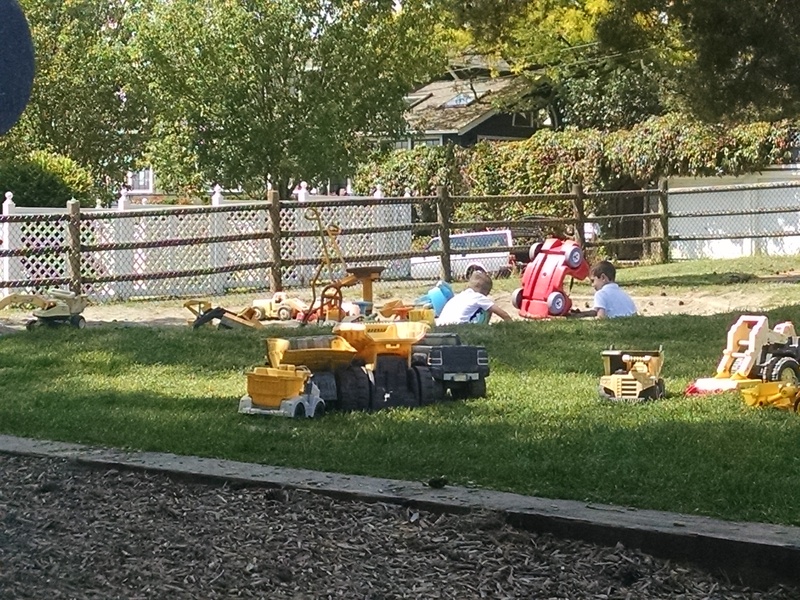 Note: there is no shade over the playground, so not the best place on a hot day. 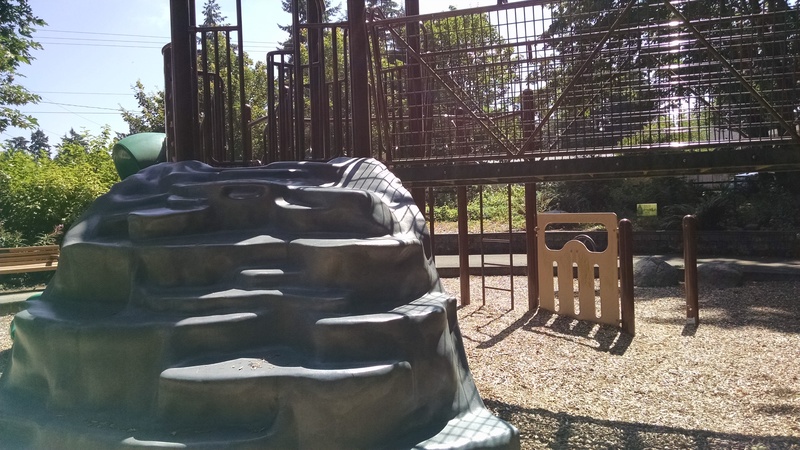 You MIGHT be able to find a spot of shade away from the playground to sit for a snack. 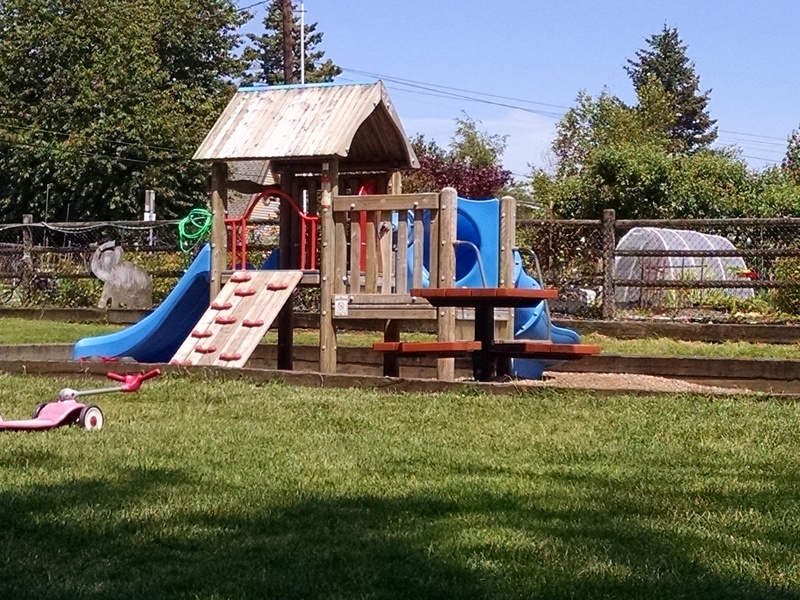 This playground is not fenced at all and has neighborhood roads on three sides. It’s built on a hill, and at the top of the hill is a basketball court, but really the basketball court and playground are the only attractions. No bathrooms. I have been to this park three times in the past few years, all on BEAUTIFUL sunny spring days, and been the only family there. My son was disappointed each time to not have anyone to play with. Today it was busier – a couple people came to check out the new equipment. Then, since it was Wednesday early dismissal, lots of kids stopped by on their way home from the nearby elementary school – some with parents, some on their own. The park is at 335 13th Avenue. 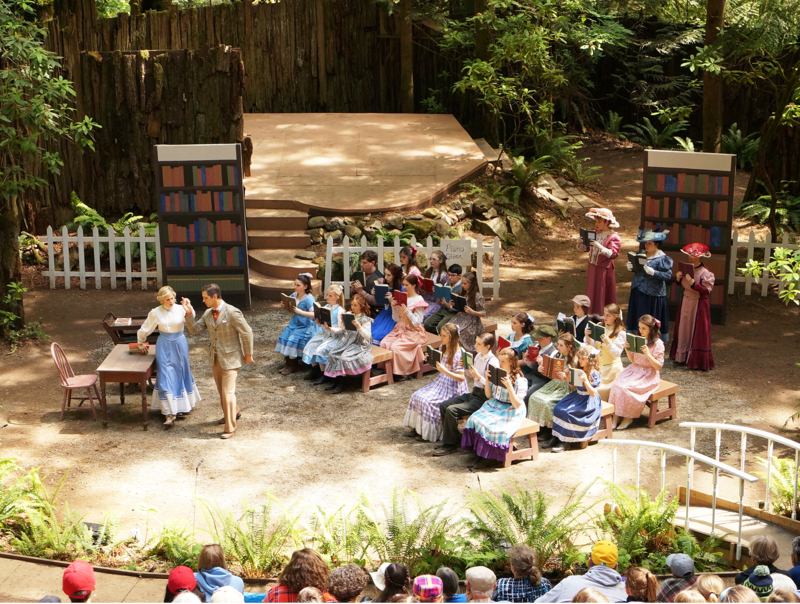 The parks department website includes a few details including a link to a map / directions. 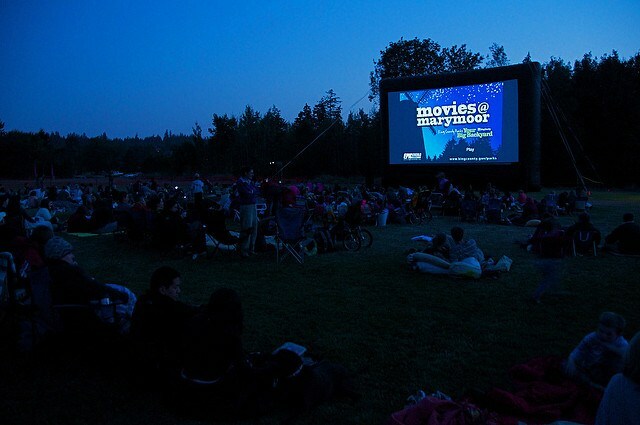 There’s also a review on the Parks of Kirkland website (which is a great resource on local parks!!) but lots of their details are out of date with the old playground structure gone and this new one installed. Check it out and comment to let me know what you thought! 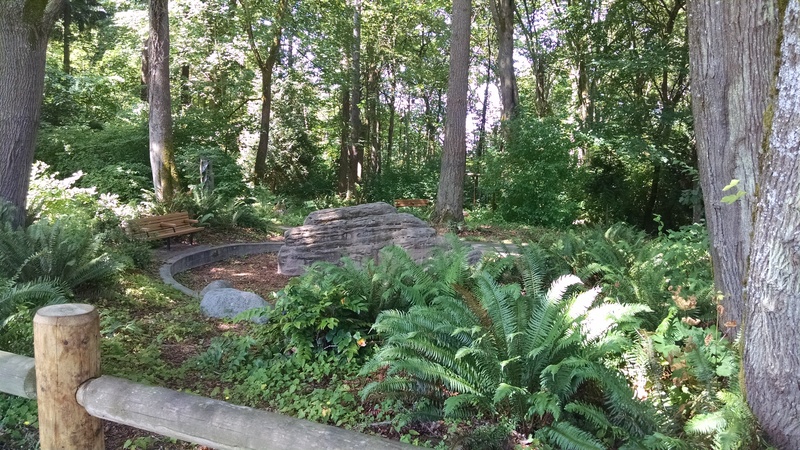 For reviews of more local parks, click on the words Seattle area in the right sidebar (on desktops – or scroll to the bottom on mobile devices). 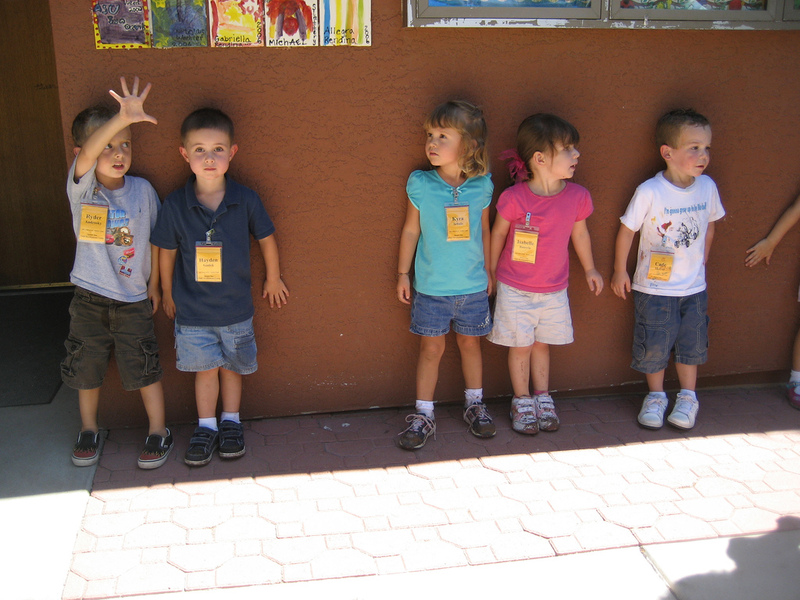 Or click on toddler dates for ideas for cheap fun things to do with toddlers. 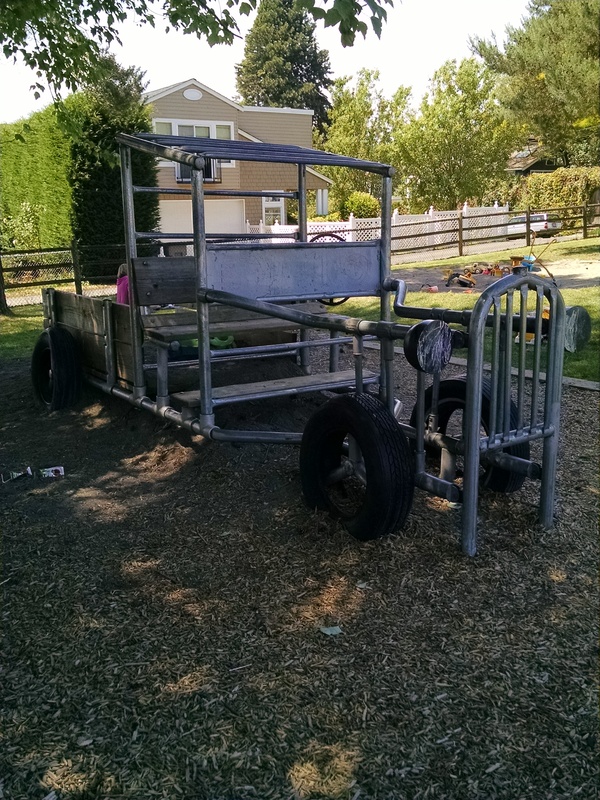 This entry was posted in Eastside Parks, Seattle area and tagged Kirkland, park, Playground on June 8, 2016 by Janelle Durham.